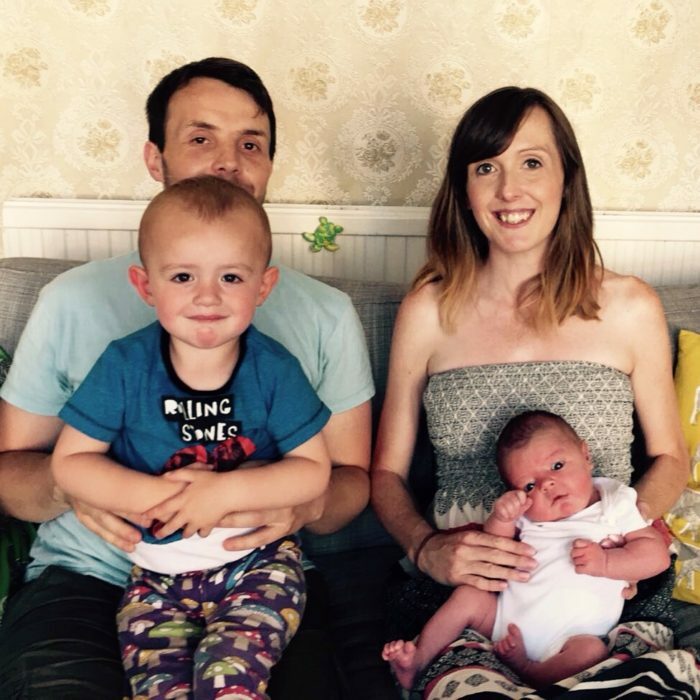 AFTER being convinced our little one would come early and even be a May baby, I was a bit disappointed to wake up on our due date knowing time had run out to go into labour naturally. Because of my gestational diabetes I was booked in to be induced at 40 weeks, but had really hoped to go into labour with no intervention. I was induced with Santi at 39 weeks and spent two days pacing the hospital corridors waiting for his arrival. I’ve wondered since what spontaneous labour would be like and if his birth would have been as quick without the drugs .. it turns out it very likely would have been! At 8am I phoned the ward to check if there was a bed for me to go in at 10am as planned … I wasn’t too impressed to be told I should wait until midday as they were a bit busy. I know they couldn’t help it, but we’d got Santi all ready to go to Stew’s mother’s for the morning and planned for him to have a few hours at home in the afternoon. The later I went in, the later Stew would be with me waiting to see what was happening and the more disrupted Santi’s day would be. Anyway, we packed my bags into the car, dropped him off and headed for the hospital, joking with Stew’s sister that we’d go the bumpy way to try and bring on labour. It felt really odd that everyone knew we were going in to hospital to have the baby, and I think people were more excited than us. Of course I was excited to meet our little one, but knowing that you’re going to be induced and that labour is just around the corner made me more anxious than anything. The consultant hadn’t helped at my last appointment with talk of baby’s shoulders possibly getting stuck and the chance of an emergency c-section if he was very big. Not really something you can look forward to! When we got to the last roundabout before the hospital I mentioned that my back felt a bit crampy and said that knowing our luck the baby would have come that day anyway. He then decided to tell me he hadn’t brought any sort of bag for himself … talk about tempting fate! The ward must have been quite busy because it took a while for the midwife to see me and hook me up to the monitor. Stew munched his way through a Morrisons salad pot from the supplies we’d stopped off for on the way (it later dawned on me there had been a real chance of going into labour in the supermarket) while I was too nervous to eat. The last glimpse of the bump and looking both tired and nervous! The monitor showed some fairly regular contractions, but they just felt like the braxton hicks I’d been getting at home and similar to the readings I was getting with Santi. By the time the midwife came back for the third time to look at the chart I could feel twinges with the tightenings and started to wonder if they were actually contractions or if I was getting white coat syndrome. 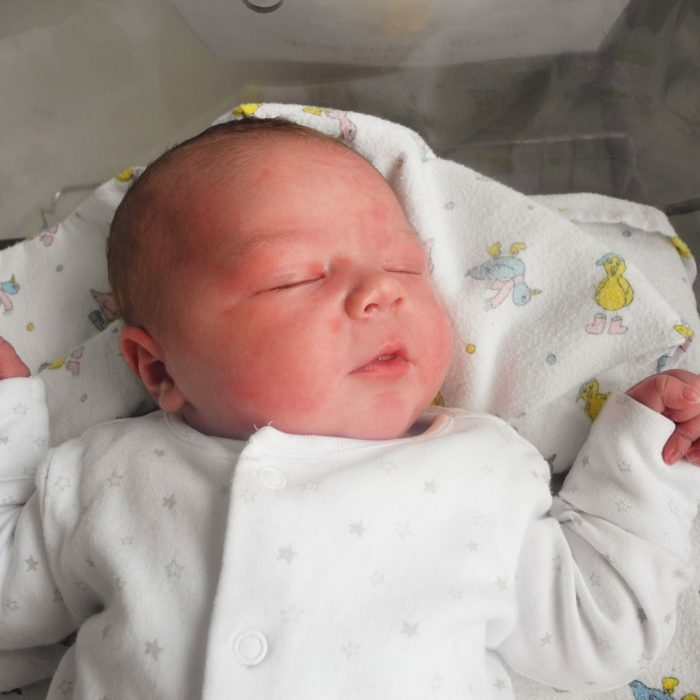 The midwife clearly didn’t believe me – and why would she when an hour or so earlier I was absolutely fine – and said she’d come back in a bit to examine me, warning that if I was in early labour the doctor would probably advise against induction. Great, we’d probably be sent home again and told to phone if things moved on. I decided it would be a good time to eat something in case my blood sugars dipped and I’d have to have an insulin drip (the thought of a cannula freaks me out more than labour). 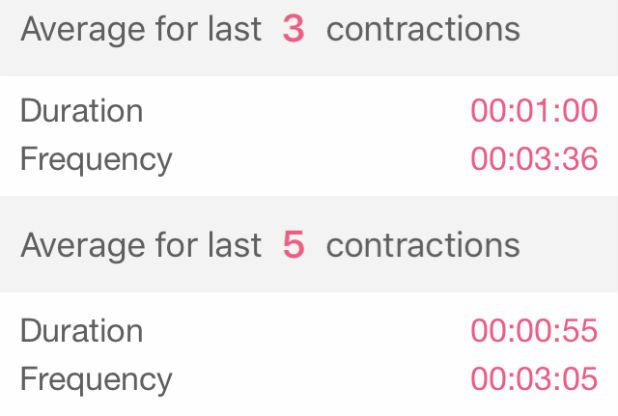 It turns out I was 6cms dilated, and within no time at all I was having contractions every three minutes, according to an app I downloaded between the first few. To make myself feel better I recorded the pain as “mild” even though it was getting pretty intense. I had two painkillers and tried to simultaneously breathe through the pain and block out Stew’s attempts at distracting me with arguments for and against the Brexit. I think more than one hypnobirthing class would have been handy at this point … Forget imagining I was sunning myself under a lemon tree, I was trying not to pass out with the ridiculous heat of the ward. A screenshot from my contraction app … it was quite a good distraction! Oh, and I didn’t avoid the cannula, the midwife kindly inserted it between what were very strong contractions and helpfully pointed out that I was “a bit of a bleeder”. It’s a good thing I did have one because I was dehydrated and needed a drip to get my fluids up. In a bit of a panic that the midwife wasn’t coming back any time soon, and still in complete shock that it was all happening so quickly, I sent Stew to tell someone I felt like the baby wasn’t far off. I really hoped it wasn’t because I didn’t want to cause a fuss over nothing and the paracetamol wasn’t having much of an effect. They brought in a wheelchair as I changed into my oh-so-attractive Primark nighty to cool down, and disaster struck as Stew gathered up our things and dropped his phone on the floor, cracking the screen for the millionth time! 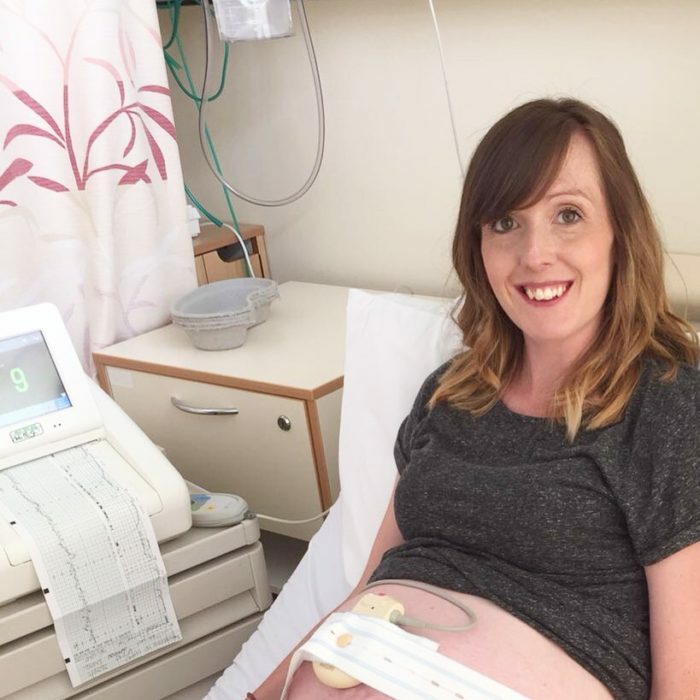 I still don’t think anyone believed how far along I was, as the midwife in the labour room kept coming and going, and asking if I needed a wee when what I really wanted was to get the baby out! She didn’t really pay me much attention until she glanced over and saw that I’d started pushing … That got her moving! I wasn’t sure how long I’d been in there (good old gas and air stops time) but we went through a few Frank Turner songs and I tried not to roll my eyes when the midwife asked if it was “that man who sung the JCB song” and Stew swiftly moved on to some Killers instead. With one push there was a pop and baby’s head was almost out. All of a sudden the monitor started beeping and a load of people ran into the room. I didn’t know if there was something wrong with the baby or me and tried not to get into a panic. At least with gas and air you kind of feel detached from what’s going on, I can’t imagine what was going through Stew’s mind with all these doctors around. They told us later that baby got a bit squashed on his way out and his heart rate had dipped. All I knew was I had to get him out quickly, and all of a sudden there he was. It was all so fast and frantic I was in shock and I couldn’t stop shaking. The next half an hour or so is a bit of a blur. I remember worrying that he was a bit blue, but thankfully he started crying and soon turned a lovely pink, and I made the mistake of glancing over and seeing the placenta in a plastic tray at the end of the bed (NOBODY needs to see that!). After all the drama things calmed down and we were brought tea and toast while we phoned family to share the news. I think we shocked everyone as they definitely weren’t expecting an announcement that quickly! I somehow managed to have a shower before we were wheeled to the ward, and felt the same pride as with Santi when all the staff stopped to say congratulations as we passed. I was so relieved everything went well because the consultant had scared me into expecting so many complications that I never expected to have a natural birth, let alone one so speedy. We joke that Santi’s arrival was an indication of his whirlwind personality, and it looks like we might have two busy bees on our hands. Just like his determined big brother, when baby boy was ready to make a move he really went for it. All of a sudden we’re a family of four, we have two sons and I’m well and truly outnumbered in a house of boys (well, me and Jeremy the beagle, of course). Our first photo as a family of four … we’ll attempt to get one where both boys are actually dressed! If you’re a fan of baby photo spam, why not head over and give us a like on Facebook or follow us on Instagram and Twitter? 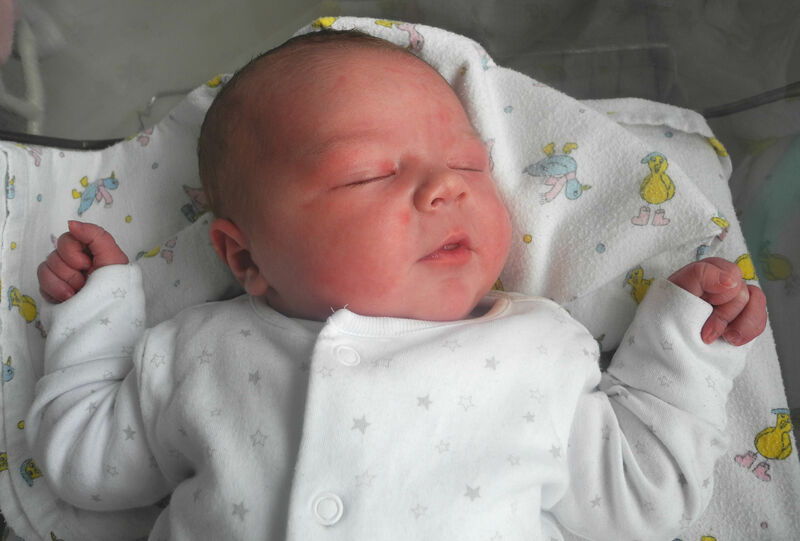 This is a lovely birth story Alana, I’m so pleased for you and yay to getting your natural birth! Brilliant birth story, there are some similarities with mine, I’ll share it with you once I’ve written it up… I smashed my phone too! !